Rise in equities got ya bullish? Be cautious. Amidst the October push to 11,000, the Dow Jones Industrial Average has continued its calamitous descent against gold which began in 2001 and shows no signs of abating. The silent market crash is real, and the fall of this paper tiger is surreptitiously ferocious. As I wrote earlier this year, gold is not an investment. Gold is money - real money (See: Aristotle). Today, the rise in the Dow is being shown for what it really is - a crash - by that golden bedrock of monetary stability. In the past 10 years, gold has fallen in nominal value sharply at times. In 2008, it plummeted over 20% in six months. It may happen again. But the real statistic worth measuring is purchasing power. Gold's real value is determined not in the price of a fiat currency, but as a ratio to other assets. 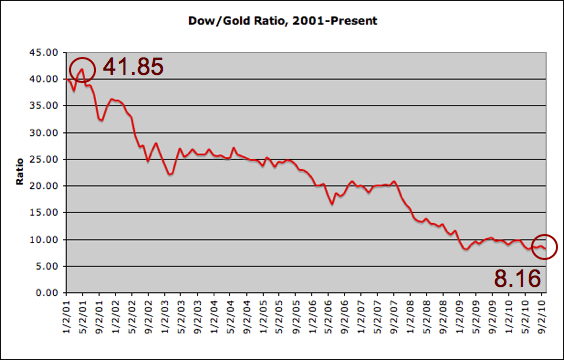 The Dow/Gold ratio simply determines how many ounces of gold it takes to purchase one Dow Jones Industrial Index. Whether the economy suffers through deflation or hyperinflation, it's the purchasing power that matters. 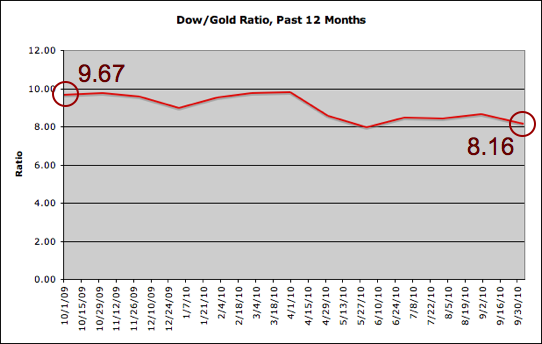 I follow the Dow/Gold ratio closely as a measure of equity strength. It is worth noting that, in the two most difficult economic periods in the past one hundred years, the Dow/Gold Ratio approached 1. As of today it sits at 8.16. Will the gold price catch the Dow to the upside as a result of hyperinflation, or will the Dow plummet towards the gold price in a deflationary vacuum? There are well-qualified arguments for each scenario. Regardless of direction, what we do know is that the ratio is narrowing - and fast! 'Til next time, that's my Saab Story. Tarek Saab is an entrepreneur, speaker, and nationally syndicated author. He is the founder of Saab & Company Inc., which owned the online bullion business, Guardian Commodities, before it was acquired by Trusted Bullion in August 2010. An avid precious metals enthusiast, his column, Saab Stories, is published on this site and syndicated on many others. Tarek rose to fame as a popular contestant on Season Five of The Apprentice with Donald Trump. He has been prominently featured in such magazines as Us Weekly, TV Guide, People, Enigma, In Touch Weekly, The Dallas Business Journal, The Fort Worth Business Journal, Digital Gold Currency Magazine, The Mensa Bulletin and numerous other print and online publications.